A Hex is defined as a magic spell, so it’s little wonder we’re bewitched by the bags from the brand of the same name. Rugged and practical, this military-inspired water-resistant backpack has room for your laptop, along with loads of other compartments that belie its slim profile. If all this Brexit talk is making you dream of more tropical climes, fire up your browser and head over to French Connection. The British high street chain’s latest drop is inspired by faraway lands and includes pieces like this rockstar take on the Hawaiian shirt that’ll slip nicely under a leather jacket until touchdown. Nostalgia is the name of the game in style right now, so it makes sense that Puma has reinvented its trailblazing RS sneakers from the eighties by teaming up with another icon of the decade. Produced in collaboration with MTV, the pastel colourway and chunky design makes for something that looks like it just stepped off an aerobics video. Rad. Carne Bollente doesn’t do shy and retiring. Founded in 2004 with the aim of penetrating the international fashion world (their words, not ours), the French streetwear brand’s garments are laden with raunchy, tongue-in-cheek erotica. This baseball cap is a surefire way to bring some NSFW vibes to your weekend looks. A punny portmanteau name and eye-catching illustrations have carved Manchester-based clothing label Hikerdelic out as one to know among workwear aficionados. Its clothes have just started being sold at menswear sanctuary END. and make for solid statement pieces in your spring wardrobe – especially the tees. Dressing for spring doesn’t get much better than slipping into a pair of chinos. Just in time for the new season, British menswear brand Farah has launched a whole range of the preppy staple featuring these regular fit, straight-legged kecks that will look sharp as a knife below a white T-shirt and unstructured navy blazer combo. Towards the end of the month, it becomes harder to justify online shopping. Luckily, ASOS has made it easier by dropping its latest Made In Kenya range. Produced in a sustainable factory with the aim of supporting the local community, the 10-piece collection is packed with head-turning pieces like this soft blue corduroy shirt. Win-win, we say. From JW Anderson to Carhartt WIP, it’s already been a busy year for Converse and the brand’s rotating line-up of impressive collaborators. The most recent is a team-up with Japanese fashion label Undercover, resulting in this rebellious morphing of the classic Chuck Taylor high-top finished with a quirky lacing system and metal ring piercings. People have been losing their menswear-y minds over the nineties in recent seasons, so it was never going to be long before our scents went back in time too. Calvin Klein Eternity Flame, a reworking of the original from 1990, is loaded with a masculine base of leather, amped up with notes of fruity pineapple and verdant rosemary. A piece of outerwear from Belstaff is an investment; not just for the season ahead, but for every season after it. 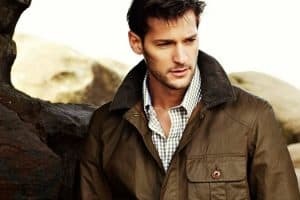 With such timelessness and quality obviously comes the price tag to match, but this water-repellent, overshirt-style jacket will be a vital tool in your battle against those dastardly April showers. Given that your feet can get pretty gnarly, particularly during summer, it’s advised you refresh you sock rotation every 12 months. Luckily, those by outerwear brand Finisterre are rendered in wool, which has natural antibacterial properties, so they’ll stay fresh for longer. London-based womenswear brand Hanger creates clothes inspired by kitsch nineties Japanese culture. The results are bold, eye-catching and invariably involve latex. Luckily there’s no rubber involved with its first menswear offering which just dropped exclusively at hipster hangout, Urban Outfitters. Introduced in 1993 as an off-road running shoe, the Reebok Aztrek recently returned after a 25-year hiatus. Reworked to chime with the current chunky trainer hysteria, this version is an easy way to slip into the trend with a high-abrasion rubber outsole and calming grey and light yellow colourway. It won’t be long before temperatures rise sharply and your sweat glands conspire to undo all your hard sartorial work. Get a jump start on staying cool and dry by arming yourself with a summery, breezy polo shirt like this knitted, mid-century dazzler from Mango Man. You’ve survived winter, you deserve it. When L’Estrange was founded in 2013, it started with one aim – to bring tailored elegance to the hoodie. Half a decade on, the brand now applies this approach to a whole range of basics like these drawstring trousers which are elevated through a pristine fit and cut. What good are all these new garms if we don’t have a planet to strut about them in? Weekday’s new sustainable and recycled denim collection is the solution, offering up handsome kit cut from 100 per cent recycled fabrics. Spanish high street brand Pull & Bear has joined forces with the country’s biggest music event, Primavera Sound, for a branded collection of festival must-haves. Tie-dye and waterproofs are in abundance alongside more stripped-back pieces like this sleek unisex coach jacket finished with reflective letters on the front and back. Most knitwear is unlikely to survive the post-winter purge, but while sticking everything into storage consider keeping a cable knit jumper to hand. It’s perhaps to do with its associations with the sea, but nothing looks better paired with some tailored navy shorts on cooler evenings. World famous watch expo Baselworld might have only just kicked off in Switzerland, but there’s already chat about the new golf-focused edition of The Tag Heuer Connected Modular 45 smartwatch. The bezel goes up to 18, like the holes on a course, and there’s a new app to use that lets you view maps of 39,000 golf course around the world. It might still be too nippy to crack out the logo T-shirts, but nothing is stopping you from getting the same look from a hoodie. This retro-inspired example from Stüssy, cut from a soft, comfortable cotton-blend, features a reimagined take on the surfwear meets streetwear brand’s logo. Despite the vanilla colourway, it’s anything but.